Walking through a wheatfield north of Wargrave. Ten people came to Ian's walk on Thursday evening 4th July. It was a warm and pleasant evening with clear skies – ideal conditions for an evening walk. We set off from Wargrave at 6:45pm and headed north along Dark Lane to the edge of the village. 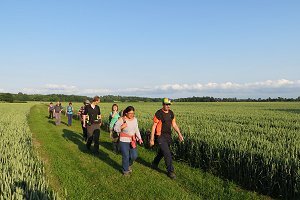 We followed the road past Wargrave Manor and then crossed a number of wheat fields and a golf course on our northward route. 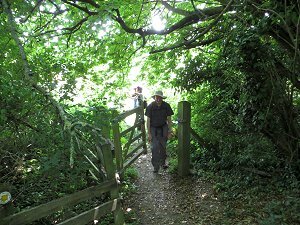 We re-joined the road at Worley's Farm and followed it east until the next footpath, which took us south-east through a hedge-lined grove towards Crazies Hall, a large white manor house in the hamlet of Crazies Hill. Walking through an enclosed path to Crazies Hall. Back on quiet roads again we headed north-east to Cockpole Green and then on footpaths through a big stud farm on Knowl Hill Bridleway Circuit, where we turned south toward Warren Row. Passing through the village of Warren Row, we headed south-west through woodland towards Bowsey Hill. As the light faded, and with the extra cover of the trees sporting their summer foliage, the woodland took on a new character. It is quite easy to see why our ancestors didn't like travelling through woodland at dusk or at night. All sorts of creatures and sinister figures could be imagined when looking at the silhouettes of fallen branches and other woodland debris. 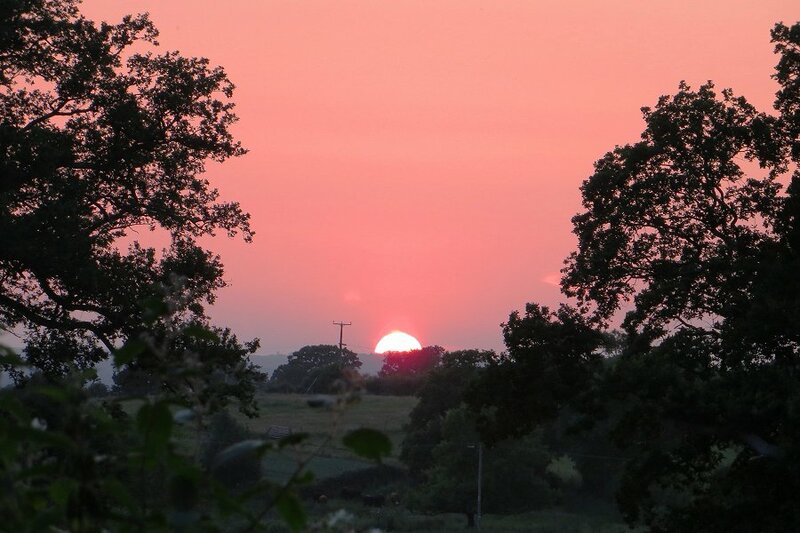 Sunset viewed from Boles Wood toward Lower Shiplake. Every so often, there was a break in the tree cover and the evening sky seemed surprisingly bright. We got a glimpse of the sun setting over Lower Shiplake before we disappeared back into Boles Wood. Finally emerging from the wood, we crossed familiar wheat fields and passed Wargrave Manor again on our way back to the car park where we'd started. We finished the walk at about 9:40pm, which was slightly later than the leader had anticipated, but the sky was still glowing with a navy blue. With a choice of pubs in Wargrave, we stopped off at the Bull for refreshment before heading home. See the route of this walk on Google Maps. Crossing a ford near Arborfield. Sunday 7th July was a hot day. It was already 23°C at 10am when eighteen of us set off from the car park at Ye Olde Leathern Bottel and it was close to reaching its high of 28°C (that's 82°F in old money) by the time we finished the walk at lunch time. Crossing open land near Bear Wood Lake. 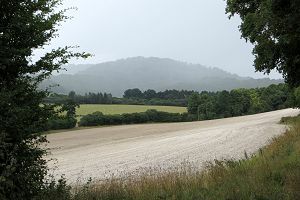 The walk started off by following some quiet back-roads behind the pub (Limmerhill) before heading west into the woods of Fox Hill and then Bear Wood. Emerging from the woods and crossing a ford, we followed the road to Arborfield, turning north just before reaching the village. We continued more-or-less north toward Sindlesham, turning round at Carter's Hill Farm to head south-east back into Bear Wood, passing Bear Wood Lake golf course. Crossing our earlier trail we headed south into the woods at Barkham. Walking through woodland near Barkham. 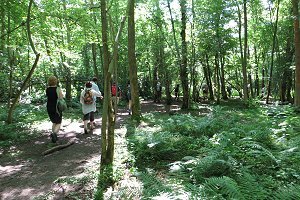 We were all very grateful for the amount of shade on this splendid seven mile route, and for the lack of nettles and brambles, as most of us were wearing shorts! After drinks and a spot of lunch, we all left the pub and made our ways home. See the route of this walk on Google Maps. Sunday 14th July was another hot day. It was 24°C when we set off from Lambourn and it was 29°C by the time we returned, mid-afternoon. What a difference from last summer! Crossing the gallops on Eastbury Down, near Lambourn. This was a repeat of our first ever walk, which we did a year ago. We only had eight people on the walk this time round, which was three more than last time but still lower than our usual turnouts. Maybe Lambourn is too far to go for a 7 mile walk or maybe it was just too hot for a walk with 300m (980ft) of ups and downs. Anyway, we started off from the free car park in Lambourn and toured through the village, passing the sports ground before crossing the river Lambourn on our way. The river looked quite low, reflecting the recent lack of rain. We then turned north-east up on to the Lambourn Downs. This uphill stretch gained 70m of altitude in 1.5km of walking, which got us warmed up! Once up on the downs, the light breeze was as appreciated as the view. Turning north-west and then east we followed a track along Eastbury Down. Crossing a wheat field between Cleeve Wood and Stoney Lane. This was quite pleasant until we took a turning south, along an overgrown cutting through woods. By overgrown, I mean nettles, brambles and thistles! It wasn't long before those wearing shorts were cursing my chosen route. I did my best to tread down the pathway ahead of them but wasn't entirely successful. 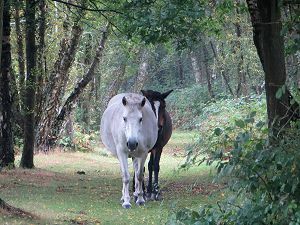 We were soon out in the open again and were passed by an adult and two children on ponies, on their way to use the gallops. There were no race horses around so they had the circuit to themselves. 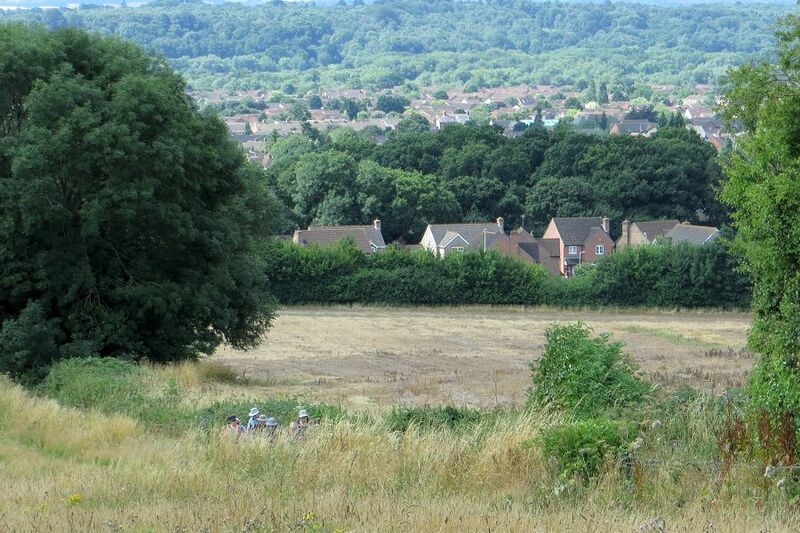 After we'd crossed the gallops and were well on our way to the village of Eastbury, we stopped for our picnic on a high point on the path through Eastbury fields. There was a bit of breeze and some shade from a tree. From our vantage point we could see across the Lambourn valley to Membury, identifiable by its transmitter mast. Getting a bit of woodland shade on Stoney Lane. 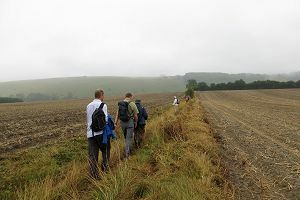 After lunch we continued south, crossing the Lambourn Valley Way, to Eastbury village and the Plough Inn. The place had received a makeover since our last visit, including new decking and fences. Very smart! 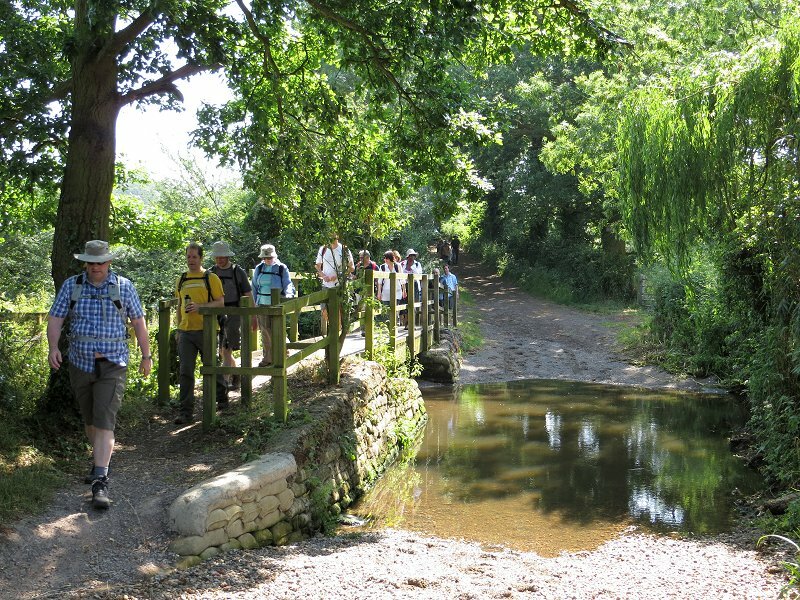 Our thirsts slaked, we crossed the river Lambourn again and headed south-west (and uphill) toward Cleeve Wood. Following the edge of the wood we appreciated the shade it afforded. 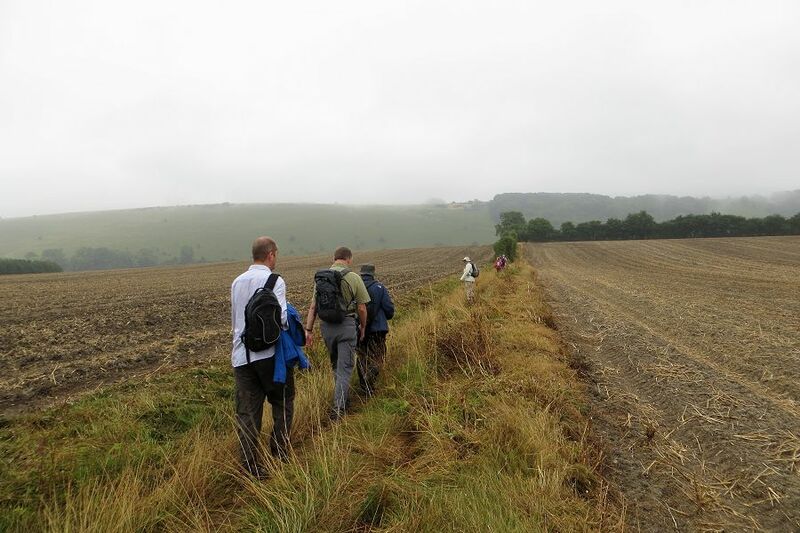 From there we crossed Stoney Lane and followed White Shute back to Lambourn. This track was tree-lined for some of the way, giving some relief from the sun. On our return to Lambourn we visited a corner shop and bought ice creams before going home. See our route on Google Maps. 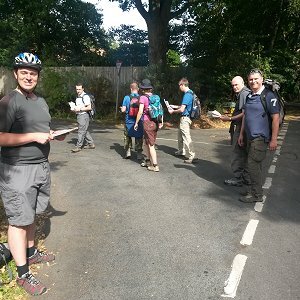 Eleven of us turned up on Sunday 21st July for the third part of our circumnavigation of the Wokingham Way. Overcast and cooler than it has been lately, at 20°C, it made for much more pleasant walking weather. A rather overgrown alley way by the water treatment works at Coppid Beech. 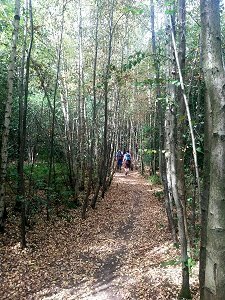 After sorting out the car sharing necessary for these linear walks, we set off from Coppid Beech and headed south by way of a rather urban route, crossing the A329 Berkshire Way. Some of the paths and alley ways were obviously not used regularly and had become quite overgrown during the recent warm weather. One of our party had a pair of secateurs and did some on-the-spot trimming of the brambles and nettles. Continuing south we passed a new housing estate where half of the houses were still being built. 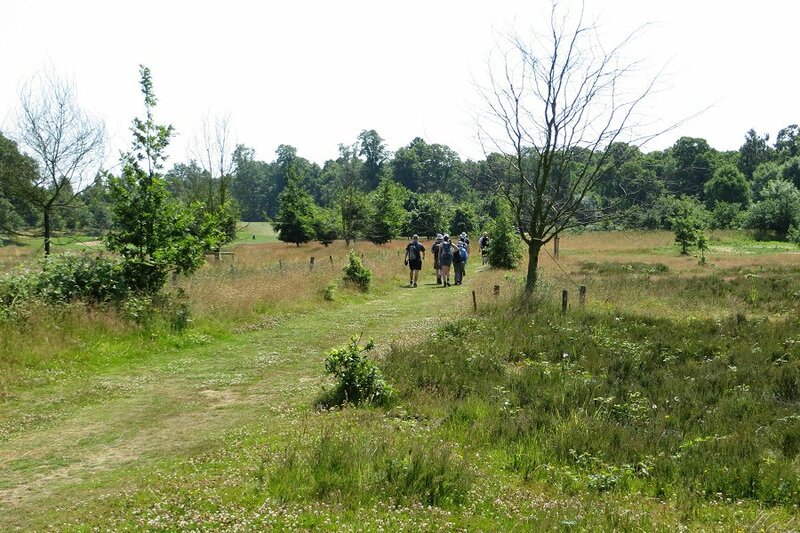 Then skirting Downshire Golf Complex and Great Hollands Recreation Ground, we briefly joined Nine Mile Ride before heading south again, leaving the urban part of our walk for Bramshill Forest. 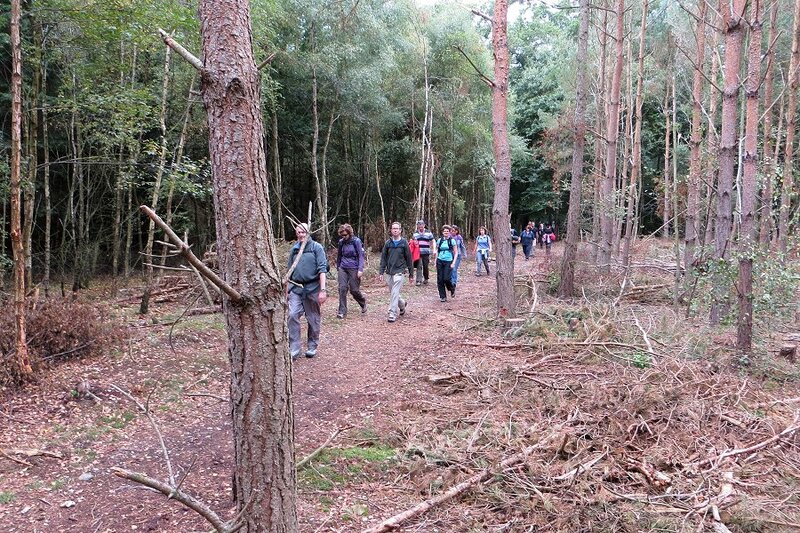 Walking along the well-defined paths through Bramshill Forest. After the initial uphill yomp into the forest, we had a pleasant route on well-defined paths through a mixture of tree cover and open heath. At one point we passed under the A3095 Foresters Way via a short tunnel. Throughout the walk we noticed that bracken was growing very well and was taller than us in places. We stopped off in the woods for our picnic lunch where we'd found some fallen trees to use as seats. The sun came out and the temperature began to rise noticeably after lunch as we passed the slightly sinister looking Broadmoor Hospital on our way to Crowthorne. Carefully looking both ways before crossing the railway near Little Sandhurst. Walking through Edgebarrow Woods and passing by Edgebarrow Hill we skirted the northern tip of Little Sandhurst before crossing the railway line into Ambarrow Wood. 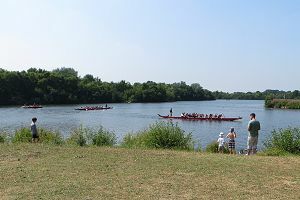 Passing Horseshoe Lake, we spotted that ice creams were on sale in the sports centre, so we stopped off and bought some. While we were eating them, we watched some dragon-boat racing on the lake. 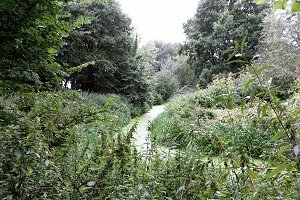 With our ice creams consumed, we continued the walk by following the River Blackwater as it weaved its way west through the gravel pits at Moor Green Lakes. 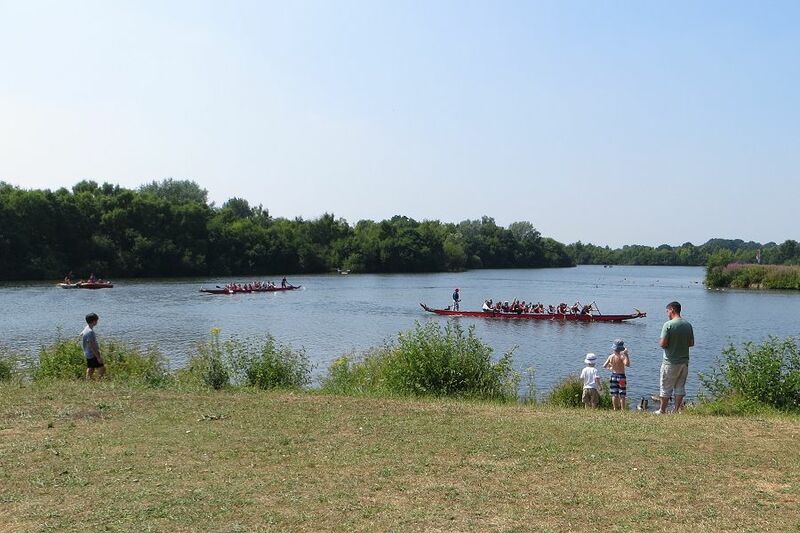 We watched the Dragon-boat Racing while we enjoyed our ice creams at Horseshoe Lake. We continued following the river until we got to Finchampstead Bridge where we took a woodland route north of the river. The shade was much appreciated as the sun was quite strong by now and the clouds had mostly gone. 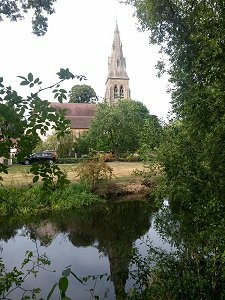 We stopped at the Tally Ho pub in Eversley for some cold drinks and a brief rest before the final mile of the walk, which took us over Eversley Bridge and through a few fields before re-joining the Blackwater River again. 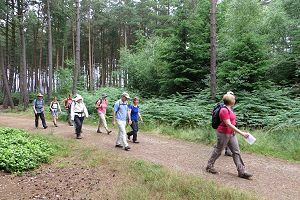 The last part of the walk was through the Bramshill Plantation, which gave us shade again. The temperature was about 27°C when we finished the 13½ mile walk. I was glad I took two water bottles! See our route on Google Maps. 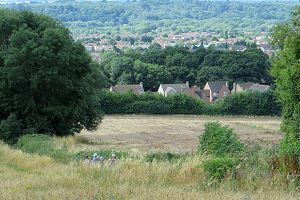 Thatcham, as viewed from partway up Hart's Hill. Can you spot us on the path behind the grass? 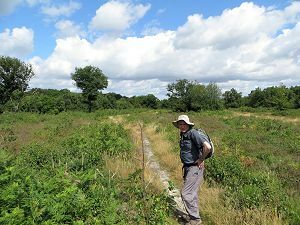 Saturday 3rd August saw eleven of us taking a walk from Thatcham to Frilsham on a circular route passing through Bucklebury Common. Three of the eleven were ramblers from other groups, joining us for the day to see what sort of countryside West Berkshire had to offer. It was a bit cooler than it has been lately, but still pleasantly warm with temperatures in the low 20's (°C) and fluffy white clouds in a blue sky. Ideal walking weather. The mixture of woodland and heathland that is Bucklebury Common. 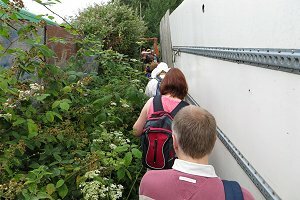 After a few hundred metres of urban walking we stepped through a gap in the hedge onto a footpath leading us up Hart's Hill. From there we followed a path parallel to the road leading to Upper Bucklebury, where we headed north through the mixture of woodland and heathland of Bucklebury Common. 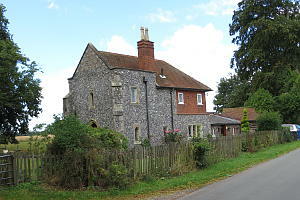 We then passed through a hamlet called The Slade and continued north, crossing a mixture of fields and copses until we reached another hamlet called Marlston Hermitage. Shortly after that, we passed through a field of maize. Our leader had recce'd the walk a few weeks earlier and the maize was barely a foot high. Now it was taller than us. Crossing a stream in the woods on Bucklebury Common. We stopped off to eat our packed lunches by the edge of a field, after which we headed eastwards toward Frilsham, crossing the River Pang on the way. The river was running high (almost up to the footbridge) and the vegetation was growing furiously, but it wasn't long before we were through it and back to the familiar mix of fields and woodlands again. 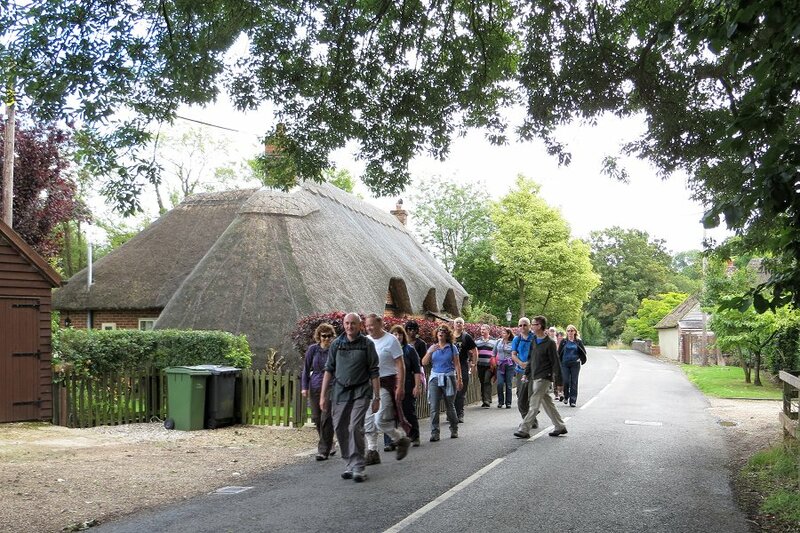 Eventually we emerged close by the Pot Kiln pub on the outskirts of Frilsham village. Of course, we popped in for a drink and spent a pleasant half-hour in there pub garden. Suitably rested and refreshed we set off southward from the Pot Kiln through High Copse. 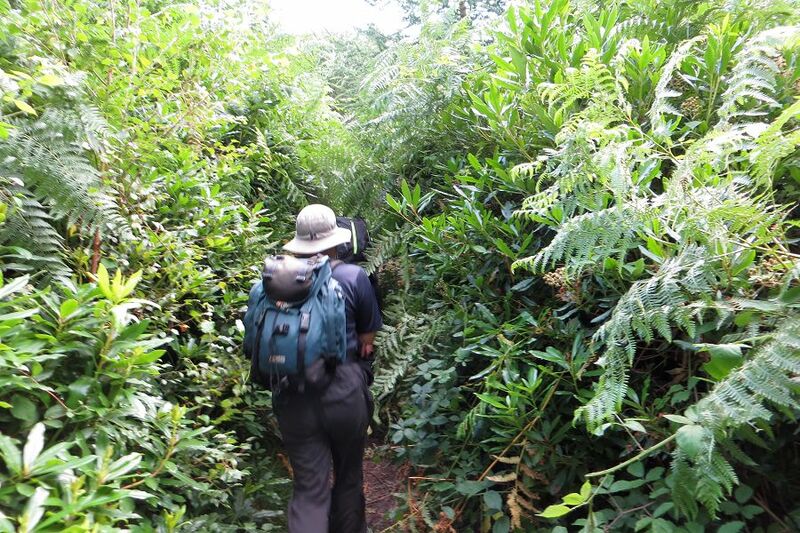 The path was rather overgrown with bracken and rhododendron bushes. The route back from the Pot Kiln was rather overgrown! 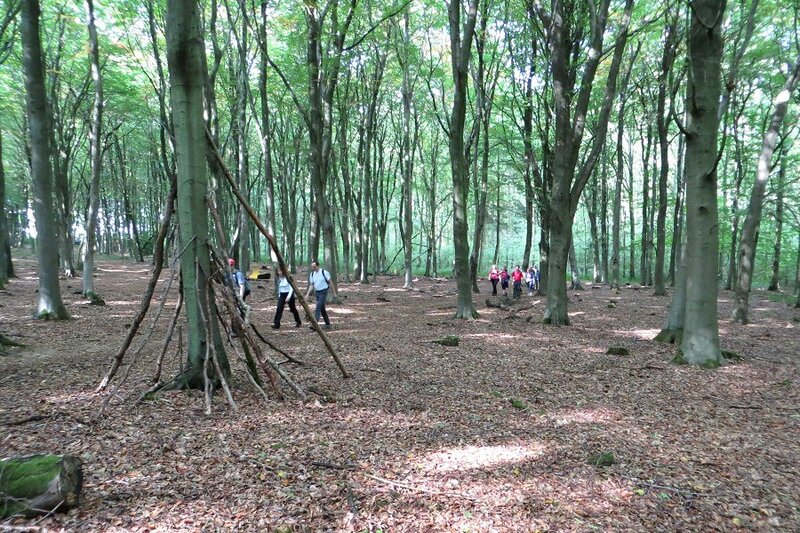 Continuing south, our route took us through more woodland and into open fields, just north of Bucklebury village. Crossing the River Pang again we entered Bucklebury, taking a route through the church yard and crossing a road on our way out. That didn't take long! It's more of a hamlet than a village. 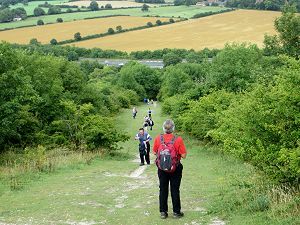 We carried on heading south and then south-west to Upper Buckleberry where we retraced our outward journey, descending Hart's Hill back to Thatcham. It started raining as we reached Upper Buckleberry, but it didn't last long. Just long enough for us to put on our waterproof jackets only to take them off again five minutes later. See our route on Google Maps. 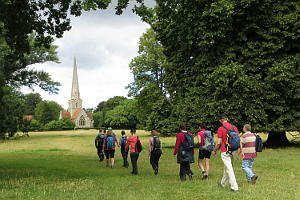 Heading through Shottesbrooke Park with St Marys Church in view. Twelve of us set off from White Waltham on Sunday 11th August for an 8 mile circular walk that would include Shottesbrooke Park and Woodlands Park. 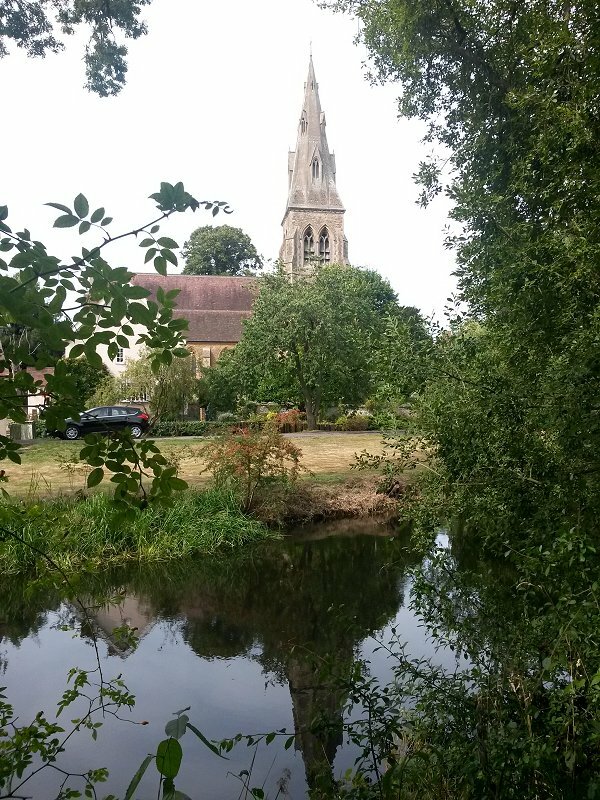 We started our walk at the industrial park east of White Waltham and walked west through the village and past the cricket ground before heading cross country toward Shottesbrooke Park, which is between White Waltham and Waltham St Lawrence. The Retro Festival was taking place at White Waltham airfield over the weekend and we saw a number of interesting old vehicles drive past as we started our walk. An interesting house that appears to be build onto the remains of a church. Walking though Shottesbrooke Park we passed a pond, a church and a manor house, whilst being frequently overflown by vintage aircraft. We exited the park along a tree lined avenue that brought us onto a quiet lane next to an unusual house that appeared to be built onto the remains of an old church. Continuing north along the lane, we crossed a railway bridge and then left the road for a footpath heading north toward Littlewick Green, where we turned east toward Woolley Green. The planned route would have followed Breadcroft Road over the railway bridge into Woodlands Park but our leader had discovered during his recce that the bridge was closed, so we took a detour across a field and joined another road that crossed the railway further to the east. A biplane leaving its smoke trail over Woodlands Park. Part of the Retro Festival. 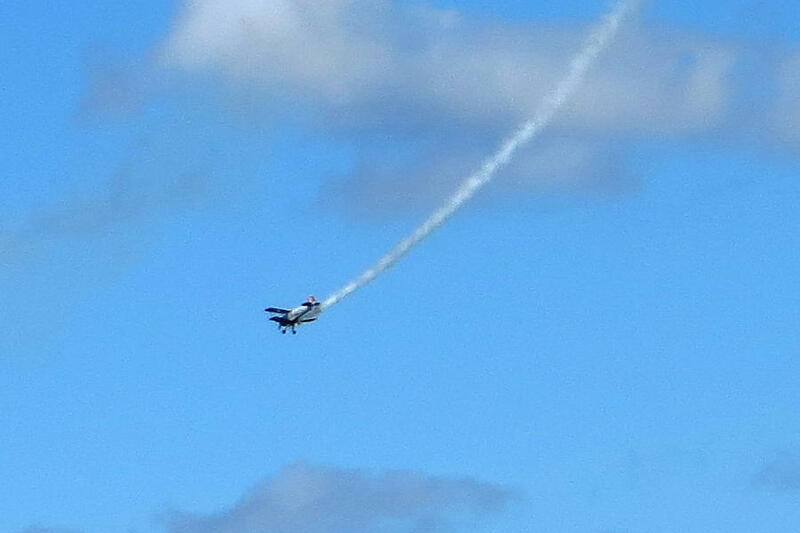 Heading south now, through the village of Woodlands Park and then through fields further south, we saw some more aerial acrobatics as aircraft left coloured smoke trails above us. By now the weather was quite hot and sunny, so we took a slight detour to find some shade where we could stop for our lunch. While we were eating our packed lunches, another walking group passed us. It was the Berkshire Walkers 20s & 30s group! As our group was founded by members of the Berkshire Walkers (hence the similar names) some of their group know some of our group quite well, so they stopped for a quick chat. After we'd finished lunch we headed west, back to White Waltham. Arriving at the industrial park where we'd started, a few decided to go home while the rest of us walked back into White Waltham for a drink at the Beehive pub. We sat outside the pub with our drinks and watched a bit of the cricket being played on the green opposite. See our route on Google Maps. Heading from Beacon Hill to Old Burghclere. Watership Down can be seen in the distant right. 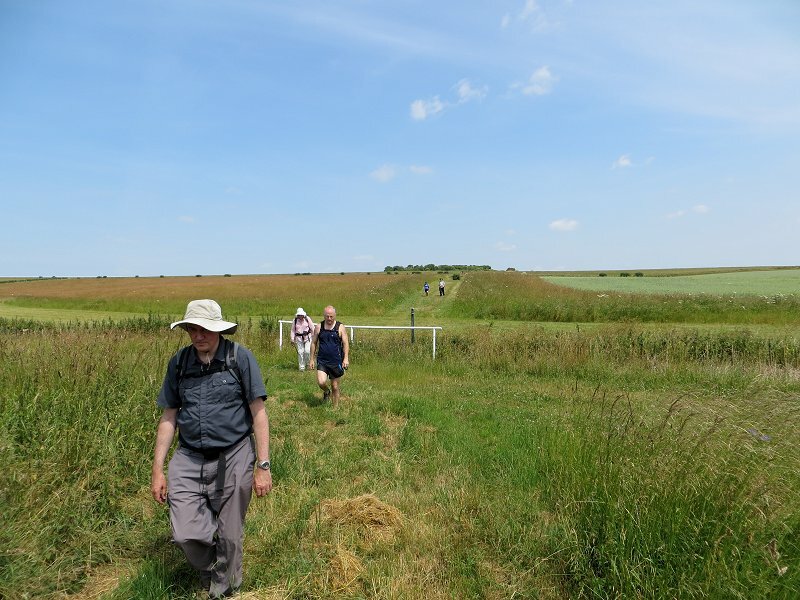 On Sunday 18th August, twenty of us gathered in the car park at the bottom of Beacon Hill by the A34 for a 6½ mile walk around. The weather was a mixture of showers and sunny intervals, gradually improving through the day. We crossed over the A34 heading east to Old Burghclere, where we turned north, passing through a field full of horses and riders getting ready for some event. (I don't know what.) Stopping to give way to the horses, we left the field and followed the course of a dismantled railway line, heading north. Eventually we came to a railway bridge. 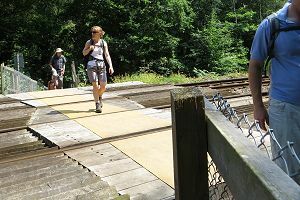 Following a steep path up the embankment, we crossed the bridge and followed the open track heading east to Duncroft Farm. From there we took a series of wooded and open paths gradually working our way north to Burghclere village. Heading from Burghclere to Old Burghclere. Looks like its raining on north face of Beacon Hill. The pub stop was at the Carpenter's Arms in the village, where some of the group had a full Sunday lunch. The rest of us had brought packed lunches and we ate these in the garden of the Sandham Memorial Chapel. After the picnic was over, most went on to join the others in the pub, but a couple of us had a look around the chapel, which was built to honour the 'forgotten dead' of the First World War. It contained some amazing murals painted by Stanley Spencer, inspired by his own experiences during that war. After the pub, we left Burghclere village and headed south through a mixture of farmland and woodland. 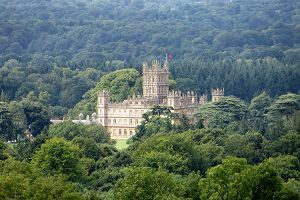 Every so often there would be a glimpse of Beacon Hill in the distance, but at no time on the walk could we see Highclere Castle, which is buried in a valley of trees. Heading up Beacon Hill with the A34 and Old Burghclere in the background. We passed through Ridgemoor Farm on our zigzag route back to Old Burghclere. From there, we retraced our outward route back to the car park, completing the 7½ mile walk. 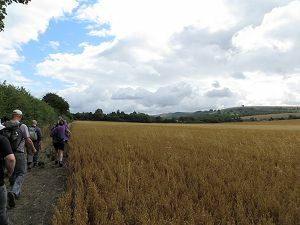 At this point some of our group went home, while the rest of us split into two parties; one going to Highclere Castle for a look around and a cuppa in the café, and the other doing an additional walk to ascend Beacon Hill for a wander around the hill fort. The rain had stopped a while ago and the route up the hill didn't look too slippery, so we began the slog up the steep chalky path to the top. On the way up, we stopped a few times to catch breath and admire the ever-improving view. 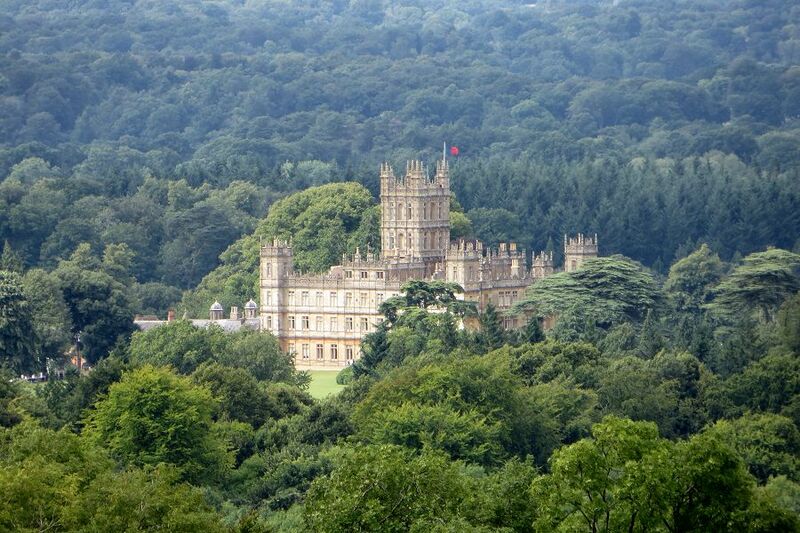 Highclere Castle aka 'Downton Abbey', taken with a long lens from the top of Beacon Hill. 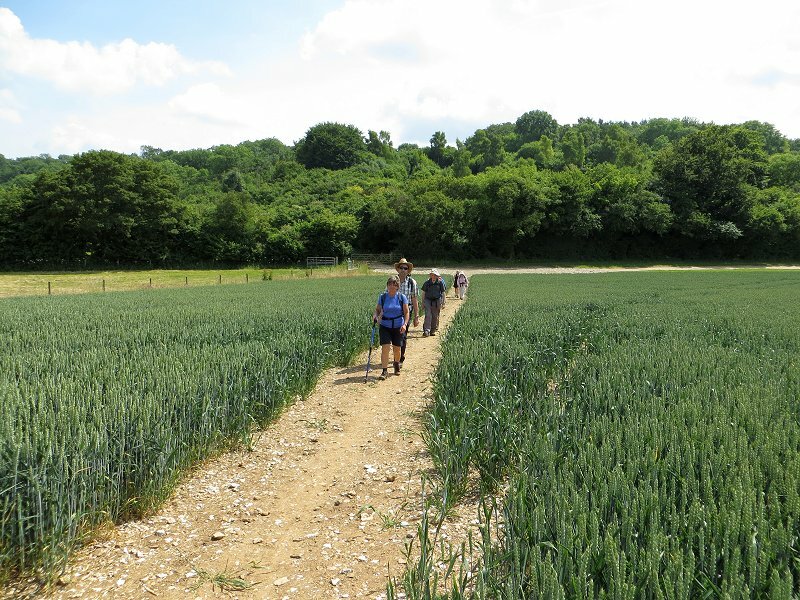 Assembling at the trig point, we surveyed the landscape around us; with Highclere Castle, Newbury and Thatcham to the north, Basingstoke and Watership Down to the east, St Mary Bourne and Whitechurch to the south. We walked a short distance west of the trig point to the grave of Lord Carnarvon before following the perimeter of the hill fort back to the path we came up, and descending to the car park. This extra walk tagged onto the end was less than 1½ miles but involved 131m (430ft) of ascent and felt like quite a workout. It was worth it though, for the excellent views. I recorded the route of the main 7½ mile walk with my GPS but the extra walk was not recorded. See the route of the main walk on Google Maps. Crossing fields to get to Inkpen Hill. Low cloud is enveloping the top of the hill. 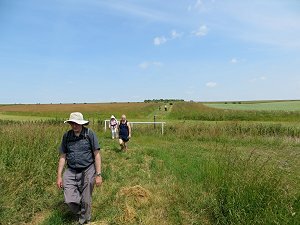 Sunday 25th August saw twelve walkers gather at Lower Green, Inkpen. These included members of the Pang Valley, Loddon Valley, Mid Berks and West Berks groups as well as our group (and possibly some other groups too). The BWWs haven't walked in this area before and I haven't walked around here for many years so I was pleased when the Pang Valley group offered it to us as a joint walk. The day didn't feel like August as we set off. Although it had stopped raining before the walk started, the jackets stayed on for warmth until we got to the uphill stretch. Combe Gibbet. Built on top of Inkpen Long Barrow. We set off following footpaths southward across ploughed fields and then up the steep slope (1 in 4) to the top of Inkpen Hill. The view from the top was rather limited by the low cloud. We followed a path along the top of Gallows Down to Combe Gibbet, built on top of Inkpen Long Barrow. After stopping to admire the gibbet we moved to the south side of Gallows Down to shelter from the wind and have a snack and drink. From there we were just able to see Combe village through the mist. After our break, we continued east along the Wayfarer's Walk to Walbury Hill, the highest hill in Berkshire, before descending its north-east side. Following a footpath north through Adder's Copse (we didn't see any snakes) we emerged onto a road, which we followed until we reached Inkpen Great Common. Wild horses living in Inkpen Great Common. We stopped in the common to eat our packed lunches. Toward the end of our picnic, two wild horses slowly approached us. Needless to say, we made no attempt to feed them, as we had been warned by signs on the way into the common that this was not permitted. As we left the common, there was a farm on the right of our footpath with something unusual in one of its fields. A boot! 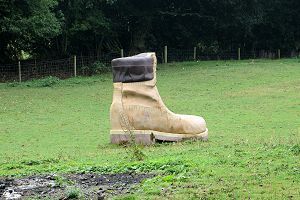 Well, a sculpture of a boot, about 2m tall! As there was no public access to the field, we couldn't inspect it closely, so I couldn't say what it was made of. 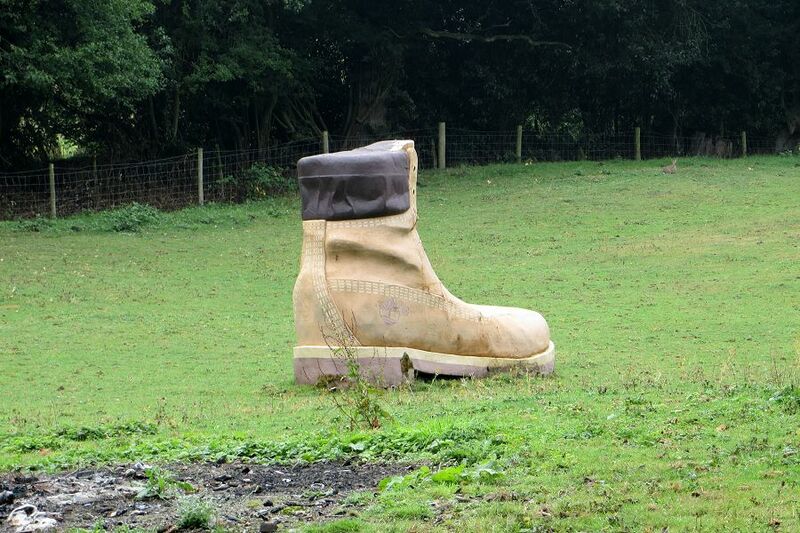 An unusual (but quite apt for us) sculpture in a field on Willow Farm. Our journey continued north from Fox Hill to Titcomb and then north-west to St Cassian's College before turning south-west back to Lower Green, Inkpen, where we had started. See our route on Google Maps. After changing out of our wet boots some of us paid a visit to the Swan pub to try the locally brewed beer. Our walk leader (Peter from the Pang Valley group) was obviously a geologist and during the walk was able to point out a number of geological features, including a couple of sinkholes. He explained how a stream could end in a basin, below which the water drained away through cracks in the limestone substrata. These didn't look spectacular, not like the well known sinkhole 'Gaping Gill', and would probably go unnoticed by most people, particularly at this time of year when the streams aren't flowing and the sinkholes are covered in dry mud. Sunday 1st September saw a collection of 20 walkers of varying experience, waiting with anticipation for the start of a very different kind of walk. 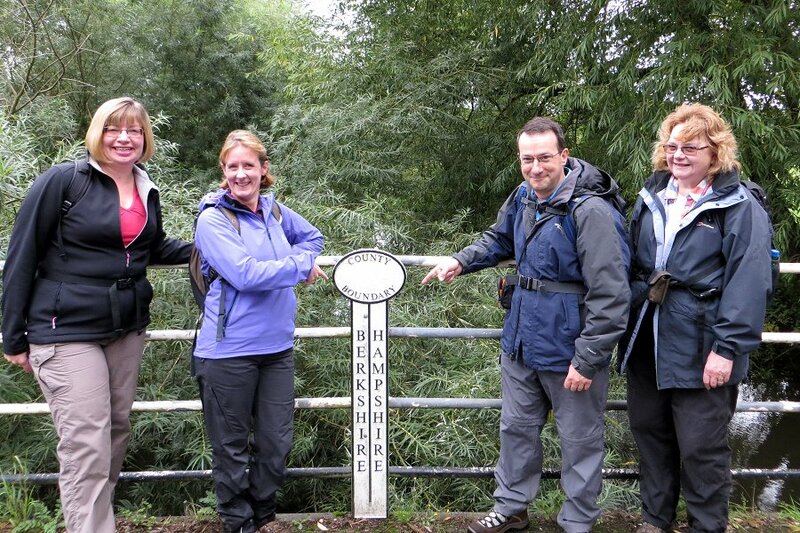 Lee, the Chairman of the Berkshire Walkers 20s & 30s group, had come up with a challenge for us. He had designed a pleasant figure-of-eight walk around Mortimer but was not going to lead it. Instead he had prepared a set of clue sheets for us and we were going to navigate ourselves around the walk! The clue sheets contained a set of photographs taken at significant points along the route, but the photos were not in chronological order. The clue sheets also contained set of instructions describing each turn and junction on the route, but these had been jumbled up and mixed with some instructions for a different walk!! 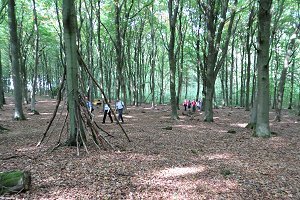 We split up into four groups, each with a mix of map reading and photographic observation skills to take on this challenge. Looking for the next clue at the corner of Mortimer Common. After a bit of head-scratching the group I was in set off from Mortimer Station and headed up to the roundabout at the end of Station Road. In amongst the jumbled instructions there was an instruction to turn right at this roundabout, but we also found an instruction to turn left! Hmm...! We could see two of the other groups ahead of us and they had turned right, although one of the groups had now stopped and were in a huddle over the clue sheets. Should we follow them or use our heads? Following other groups is cheating and there's no guarantee that they know what they're doing anyway, so we used our heads. After looking at the other clues we realised that the walk must be mostly around Mortimer village, and turning left at the roundabout would be the most direct way of getting there, so that's what we did. In the meantime, Lee was riding his bike around the route, checking up on the groups to make sure none of us were seriously off course. We got as far as the church at Stratfield Mortimer before Lee called us on the mobile phone to ask where we were. A short conversation soon revealed that we were in the wrong place and therefore the instruction to turn left at the roundabout was one of the false clues! Retracing some of our route and taking a small short-cut back on to the correct route, we were now last in the running order. The remaining clues began to make a bit more sense and we followed the route to Wheat's Farm. We took a wrong turning at a crossing of footpaths in the farm, but soon realised our error and were back on track heading toward Mortimer village. Entering woodland near Mortimer Common. On route we saw a path across a field that looked very similar to one of the photographic clues. All of my group stopped and studied the landscape and the photo. They were very similar, but something wasn't quite right about the telegraph poles crossing the field. Our suspicions were confirmed when we saw one of the other groups coming toward us along the path we were about to take. They had obviously tried it after looking at the same photo and it had turned out to be incorrect. At the same time, one of our group excitedly exclaimed that she could see one of the other photographic clues at the entrance to some woodland further along the path we were already on. Result! We were on track and weren't at the back any more. 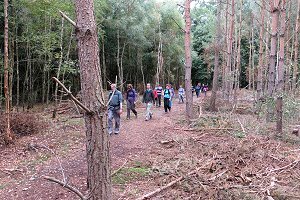 We continued following clues and spotting photos with varying degrees of confidence and doubt, but mostly following the intended route around Wokefield common, and frequently coming across the other groups on the way. After lunch we continued interpreting clues and making our way along the route until we came upon all the other groups eating their picnic lunches together with Lee. He asked what had kept us. When we said we'd stopped for lunch he pointed out the clue that the other groups had obviously seen, which mentioned a location for the lunch stop. That explained the quizzical looks we'd had earlier. The church at Stratfield Mortimer toward the end of the walk. In pole position, we continued navigating our way to the pub stop while the others finished their lunch. 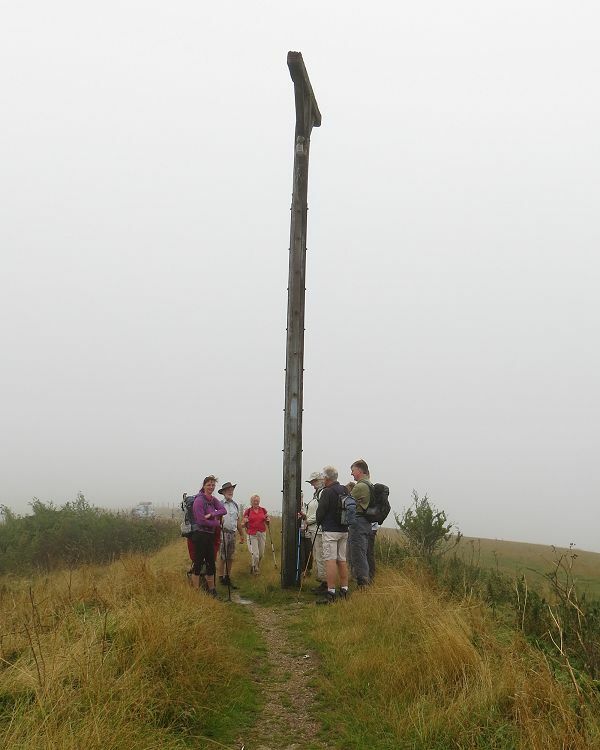 The route took us through Mann's Farm and back to field with the telegraph poles that we'd studied earlier. From this side of the field the photo was a perfect match! We were the first group to reach the pub, where we found Lee waiting for us. The other groups weren't far behind and once we'd all got our drinks, there was much discussion between the groups. Most people said that they found it quite difficult to start with but it became easier and more enjoyable as they got into it. Drinks finished and notes compared, we left the pub for the last section of the walk. This took us south of Mortimer and then east to Stratfield Mortimer, passing the church that my group had passed going the other way when we'd taken our first wrong turning. It was a straightforward journey back to the start point at Mortimer Station. It was interesting to see that different groups had made different mistakes through the day. This shows how meticulously the planning of the whole exercise had been. (If there had been flaws in the clue sheets then we'd all have been making the same mistakes!) 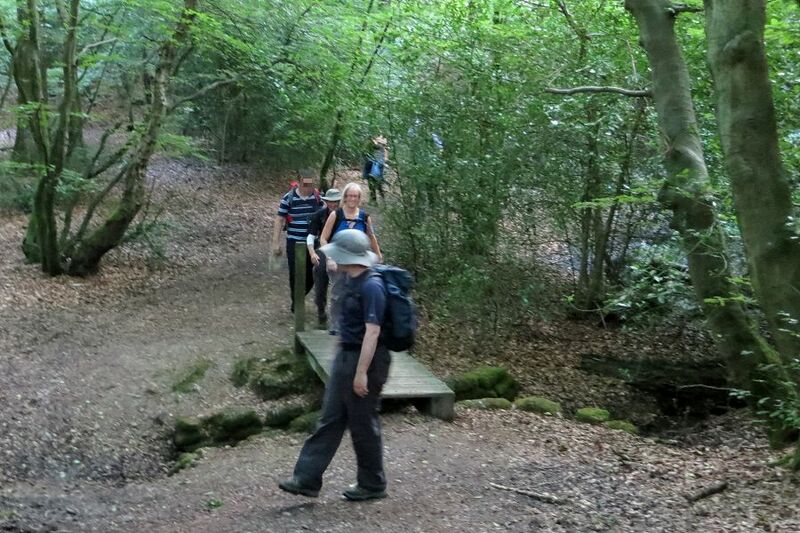 This enjoyable day out has helped many of us improve our navigation and teamwork skills. 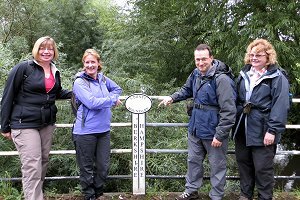 Our thanks must go to Lee for putting in so much effort into the planning of this instructive walk and let's hope that people who haven't led a walk yet will now have more confidence in navigating country footpaths, getting lost and getting un-lost again. I would also like to thank Claudia for providing the photographs. I've been experimenting with using Bing Maps instead of Google Maps for a change. This allows you to see the route on an Ordnance Survey map. See my group's route on Bing maps. Try zooming in and out to change from Landranger to Explorer OS maps. Also try the Bird's Eye and Aerial views. Walking through the picturesque village of Boxford. The walk on Sunday 8th was a bit more conventional that the previous week's mystery walk. Not entirely conventional in that there was no picnic lunch-stop on this short walk as we would finish in time for Sunday lunch at the pub. 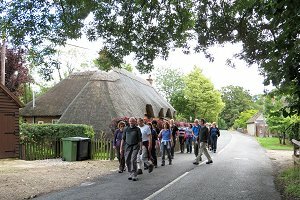 There were 19 people on this walk, including a couple of visitors from other groups and a few new people trying us out. 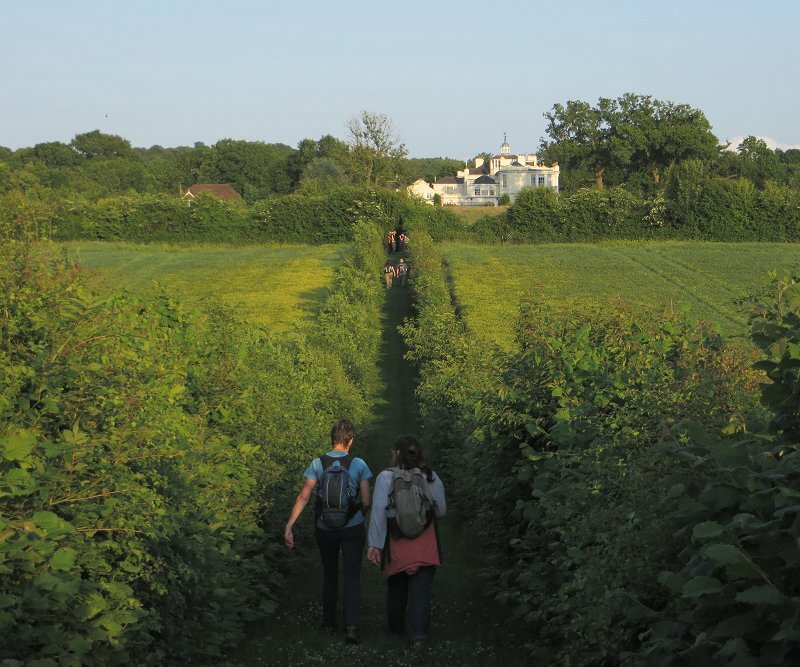 We set off north from Stockcross through tree-lined footpaths between farmer's fields. It didn't take long for us to reach the River Lambourn, which we crossed by some interesting weirs. From there we continued north-west, following the Lambourn Way long distance path, which runs from Lambourn Village to Newbury. This led us to Boxford, a picturesque village with well-kept thatched cottages. A sow and some piglets at Sole Farm. 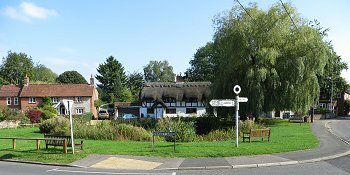 We continued following the Lambourn Way west, out of Boxford, crossing the river again at some more weirs. The route now went uphill through open fields. 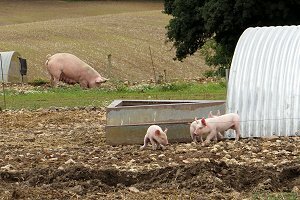 We departed from the Lambourn Way at Sole Border and headed south-west to Sole Farm, where we saw some sows with their piglets. 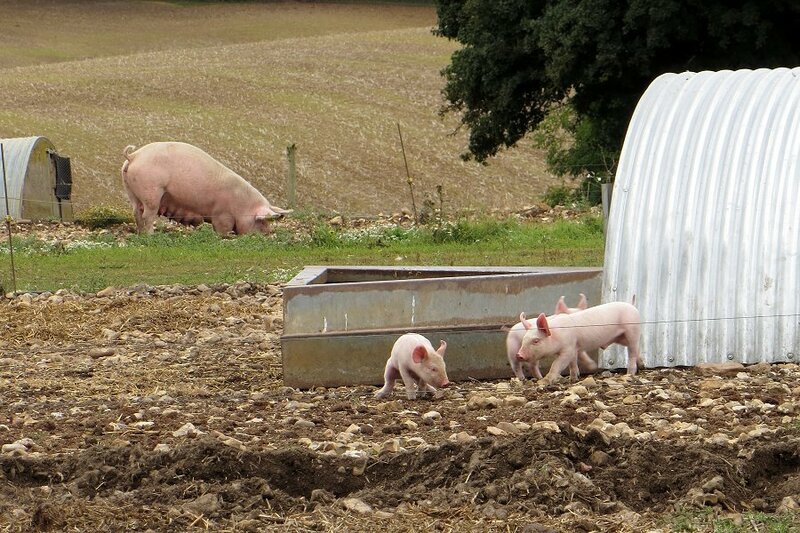 The piglets were great fun to watch but the sows were rather protective and weren't very happy until we left. Leaving the farm we headed south through Sole Common and Sole Plantation before doing a bit of road walking. This didn't last too long but did include a short section of the B4000, which is long and straight, and seems to encourage fast driving! Walking through the Sole Plantation. The route then took us through some more woodland and then more road walking, but on a very quiet minor road this time. Mike, the leader of this walk, has done this walk before but this time he has modified part of it. Originally the last part of the walk involved more road walking on the B4000 but Mike has found a permissive path through the woods back to Stockcross. Without a picnic stop and pub stop en route, this 6¾ mile walk finished in good time. After changing our boots, we went to the Lord Lyon pub in Stockcross for a drink and some of us stayed on for a very nice Sunday lunch. After the successful pub crawl around Henley-on-Thames on Saturday 14th there was a noticeable lack of people at 10am the following morning when we gathered for part four of the Wokingham Way. With only seven of us, it meant that the car sharing only required two drivers to take us from Green Park (the end point of this walk) to the Bramshill Plantation, where we were going to start. Setting off from Well House Farm, we crossed the River Blackwater to join the Wokingham Way, which run alongside the river at this point. With the small sized group, we were able to get a bit closer to the wildlife than usual. 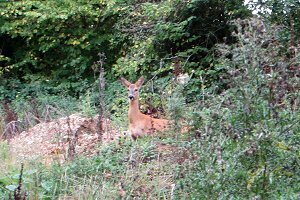 As well as pheasants and geese, we saw a deer that was bold enough to stay and watch us for a while before disappearing into the scrub. During the early part of the walk there was some debate about which county we were in. The walk started quite far south and I was fairly sure we were in Hampshire. Some of the others in the group thought it must be Berkshire if we were following the Wokingham district boundary. Eventually a signpost on a bridge answered the question. Crossing the county boundary from Hampshire to Berkshire on a bridge over the Blackwater. A look at the map showed that the county boundary runs through the centre of the River Blackwater for most of its length. We'd crossed the river a few times during the first part of this walk so we'd been walking in both counties. Honour was satisfied for both sides of the debate. We passed the confluence of the Blackwater and Whitewater where they become the Broadwater (not the Greywater, as you might expect!) and continued west along the course of a Roman road called The Devil's Highway. Nothing sinister befell us during this leg of the journey and we left the dæmonic thoroughfare at Risely. Passing under the A33 we followed a route through New Barn Farm and Highgrove Copse before crossing over the A33 in the general direction of Swallowfield. Next we crossed the River Loddon at King's Bridge and then joined a footpath that ran parallel to (and quite close to) the A33. The picturesque woodland scenery was at odds with the loud background noise of the dual carriageway. The path eventually diverged from the main road and took us to White House Farm where we found a quiet spot on the edge of a woodland path to stop for our picnic lunch. There were a few spits of rain but the heavy rain and high winds forecast for the afternoon had not yet arrived. 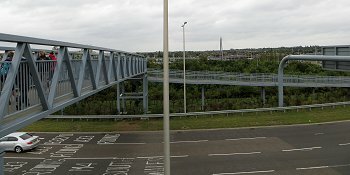 Part of the network of pedestrian bridges over the M4 Junction 11 road system. After lunch we followed the woodland path around the outskirts of Spencers Wood before re-joining the footpath that followed the A33. We continued northward along this path until reaching Three Mile Cross, where we diverted from the Wokingham Way to visit the Swan pub. 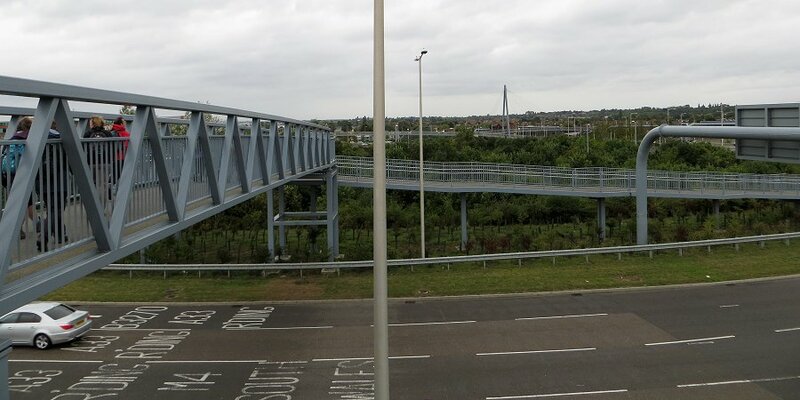 The rain started as we left the pub and we ascended the stairs and ramps onto the pedestrian bridges and walkways that cross the complex new road network that connects Reading with the M4 and A33. From our high vantage point we were able to appreciate the sheer size of this replacement for the Reading Roundabout. Also we spotted a small lake in the middle of a large traffic island. Something you can't see from the road. A green wilderness sandwiched between Green Park and the M4 Motorway. Following a footpath that ran parallel to the M4 motorway, we passed through an isolated green wilderness before reaching the smart, well-kept, Green Park. The rain stopped as we entered Green Park, quite close to the wind powered generator. This landmark, so easily visible from the motorway and from most of Reading seemed enormous when viewed at this close range. We followed a route through Green Park, which contained an interesting mix of modern business units, shops and children's play areas. The style of buildings and the general layout of the wide roads and paths put me in mind of the business parks I visited when I was working in California. This fourth part of the Wokingham Way (which is actually sections 7 and 8 in the leaflet) certainly showed us the variety of rural and urban landscapes to be found on this relatively new long distance path. It also allowed me to explore parts of Reading that I have driven past many times without knowing what's there. Walking through Oakley Park at the start of the walk. On the last Sunday of September we were promised good weather by the Met Office. There was just a sprinkling of rain as 15 of us waited to start the walk. The rain came to nothing and we set off along Station Road down towards the church. We took a slight detour through the churchyard and then onto a footpath through Oakley Park. This parkland surrounds Oakley Hall, which can't easily be seen from the footpath as it is partly concealed by woodland. 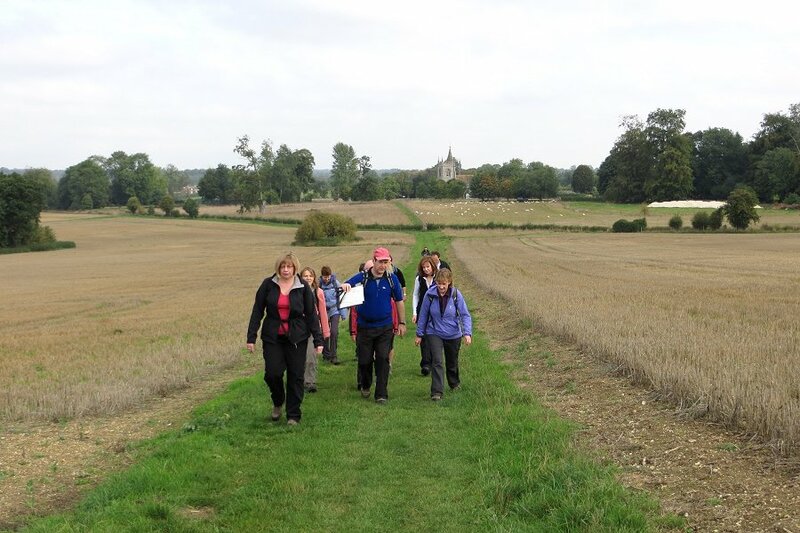 The sun came out as we joined the Wayfarer's Walk, just south of Oakley Hall. Fleeces were removed and sunglasses donned while we stopped for a water break. Following the Wayfarer's Walks under a railway bridge and turning east we headed into Bull's Bushes Copse. 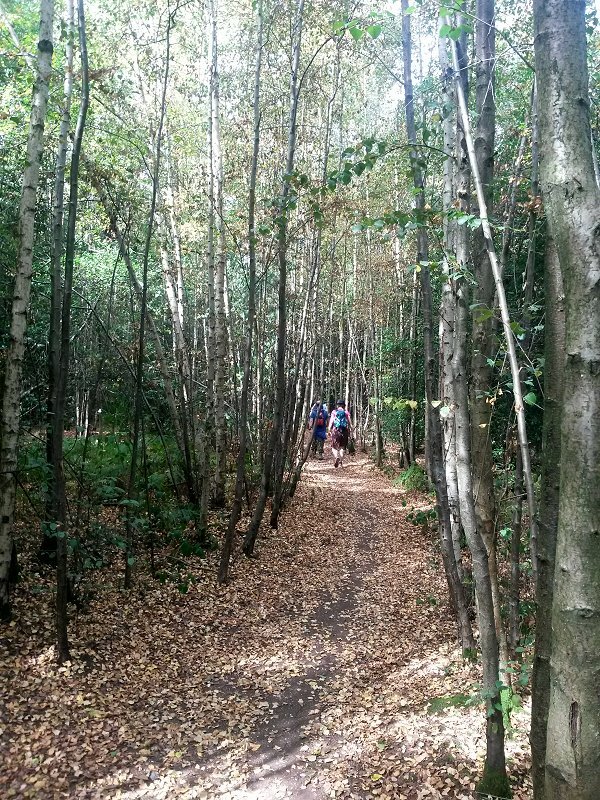 Walking through Bull's Bushes Copse on the Wayfarer's Walk. Emerging from the copse we came across some expensive and secure looking houses. A signpost made it known that the road was private and were corralled through a clearly defined and fenced path past Bull's Bushes Farm. The low fencing was tastefully done without spoiling the views and we were soon out in the open again crossing a recently harvested wheat field. Heading south-east through fields and past woodlands, the slowly increasing background noise gradually made us aware we were approaching the A30 and M3 motorway near Dummer. Before reaching them we left the Wayfarer's Walk and headed north-east, joining the course of a Roman road that took us through Southwood Farm and Great Stubbs Copse. We stopped for our picnic lunch just after the copse and just before the Roman road skirted the Kempshott housing estate on the edge of Basingstoke. Various dog walkers passed us by, but luckily the dogs were well behaved enough not to investigate our lunch too closely. East Oakley village toward the end of our walk. Continuing along the Roman road a little more and then turning left, we then headed west back toward Bull's Bushes Copse. (The route of this walk forms a figure-of-eight with Bull's Bushes Copse at its centre.) Heading north across another recently harvested wheat field we crossed over the railway into East Oakley. After stopping for a drink at the Barley Mow pub in the village, we made our way back to the car park through alleyways between the houses and fields.